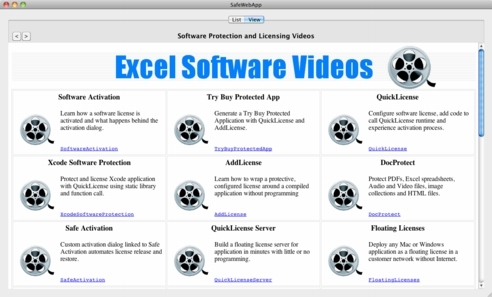 The SafeWebApp viewer provides access to the full Excel Software Video Library. SafeWebApp has an Index feature to locate and add videos to your list, then play them any time. Some videos come with a specific product and require Serial Number activation on first use. Most videos require no activation. Click the appropriate icon to download the SafeWebApp player to your computer, tablet or phone. For an older Windows computer, download the 32-bit edition and install Apple's QuickTime on your computer. For a newer Windows computer, install the 64-bit edition and you will not need QuickTime. On newer Macs, you may need to Enable QuickTime Plugin. For software protection and licensing videos, type SoftwareLicenseVideos into the Name field and click the Add button in SafeWebApp. For software design and development videos, type SoftwareDevelopmentVideos into the Name field and click the Add button in SafeWebApp. For Excel workbook related videos, type ExcelVideos into the Name field and click the Add button in SafeWebApp. For ExcelRT related videos, type ExcelRTVideos into the Name field and click the Add button in SafeWebApp. The App name is shown at the bottom of the Index entry as a blue link. Click that name to add and play the video. Once added, play the video anytime from the List panel by selecting and clicking the icon.